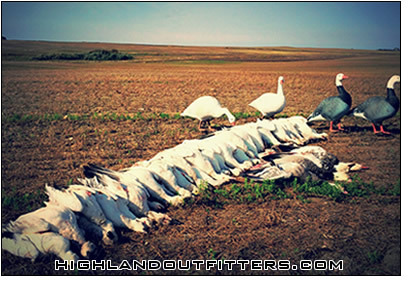 ***Canadian Resident Hunters – Please contact us for options and pricing on the various snow goose hunts we have available. I (Cory) was born and raised in the central flyway and big game bounty of Saskatchewan. My dad and Granddad were both avid hunters. They passed down their love of hunting, their knowledge of the sport and their expertise of the land to me in my outfitting zones. My family started teaching me about harvesting from nature at the age of three. 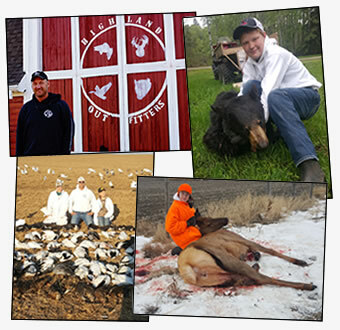 I have hunted mule deer, white tailed deer, elk, moose, antelope, waterfowl, and upland birds. I hold a 2008 world record for a 35 lb rainbow trout I caught here in my home guiding area 20 minutes from our farm. My first big game milestone was at the age of 16 on October 9, 1993 – a muzzle loader mule deer that was officially scored as a 176. I hold a professional designation in accounting however have focused exclusively on the outfitting business for the past 12+ years. While I enjoy being outdoors, hunting, and having fun, I have also acquired the education, skills and discipline necessary to organize, run and maintain a successful business long term. Having two boys, Rylan and Reed who are now both of hunting age and showing an interest in hunting and the family outfitting business is nice to see and adds a whole new element to the outdoor passion we have developed. 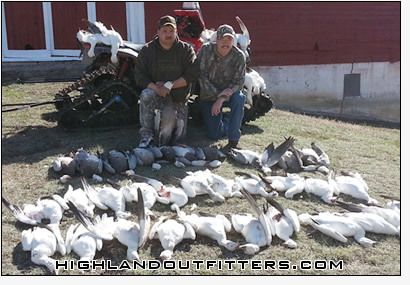 You will find I am a straight shooter and that there are no surprises hunting with me at Highland Outfitters. 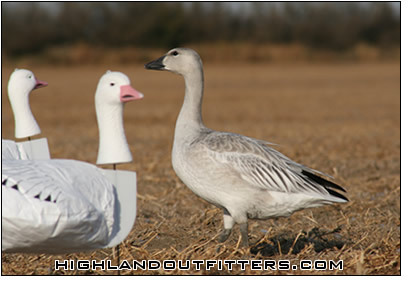 The spring snow goose migration through our area has increased noticeably in the last few years. This has resulted in some superb spring hunting that has become a very appealing option for our waterfowl hunters. Not only do we hunt geese that are staging on local waterbodies and feeding in the neighboring grain fields but we also hunt a lot of geese that are simply migrating and drop in when they see our spreads. This is due to the fact that quality feed this time of year is scarce so geese are very interested when they think they see another flock feeding that must have found some much needed grain for the rest of their trip north to their nesting grounds. 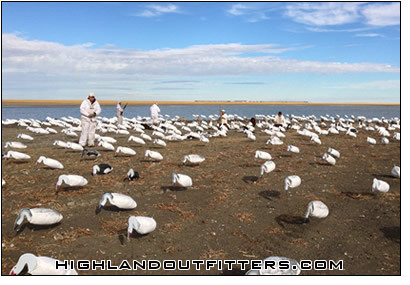 Our lodge in Saskatchewan is unique because we are situated within a mile of four different major snow goose roosting ponds and we are right in between them all. We get great spring hunting in the fields right behind the lodge as the geese fly between these ponds looking for fields to feed in. A $1,000 deposit is required to hold your spot. No spot is secure without a deposit. Your deposit is non-refundable unless the hunter or outfitter is able to find an alternate hunter to fill the same time slot. Balance of the hunt price is due by April 1st along with payment for any ammo ordered through Highland Outfitters. We also require our clients to sign a hunt contract detailing the terms under which the hunt is being offered. There are no refunds if the client arrives late or leaves early for any reason or doesn’t make it here for the hunt. There is no discount of the contracted price if the client drives to camp or rents a vehicle and therefore doesn’t require airport pick-up. We respect the rules and regulations of hunting in Saskatchewan and require our clients to do the same.